Legend has it that the process for making silk cloth was first invented by the wife of the Yellow Emperor, Leizu, around the year 2696 BC. The idea for silk first came to Leizu while she was having tea in the imperial gardens. A cocoon fell into her tea and unraveled. She noticed that the cocoon was actually made from a long thread that was both strong and soft. Leizu then discovered how to combine the silk fibers into a thread. She also invented the silk loom that combined the threads into a soft cloth. Soon Leizu had a forest of mulberry trees for the silkworms to feed on and taught the rest of China how to make silk. 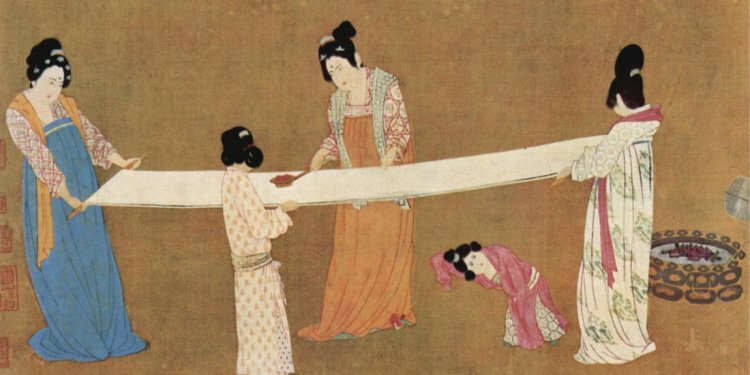 Silk cloth was extremely valuable in Ancient China. Wearing silk was an important status symbol. At first, only members of the royal family were allowed to wear silk. Later, silk clothing was restricted to only the noble class. Merchants and peasants were not allowed to wear silk. Silk was even used as money during some Ancient Chinese dynasties. Silk became a prized export for the Chinese. Nobles and kings of foreign lands desired silk and would pay high prices for the cloth. The emperors of China wanted to keep the process for making silk a secret. Anyone caught telling the secret or taking silkworms out of China was put to death. The Chinese managed to keep silk a secret for over 1000 years. However, in 550 AD the secret of silk became known to other countries when two monks from the Byzantine Empire managed to smuggle some silkworm eggs out of the country. They hid the eggs inside of their bamboo walking sticks. It wasn't until the Qing dynasty, which ruled from 1644 to 1911, that peasants were allowed to wear silk clothing. Silk was used for other purposes than clothing such a paper, fishing lines, bowstrings, and canvas for painting. Around the thirteenth century, Italy became one of the major producers of silk. Some of the finest silk in the world is made in Italy today. Silk clothing was often embroidered with designs. The most popular designs were of flowers and birds. Silk was such an important product from China that the trade route from Europe to China became known as the Silk Road.